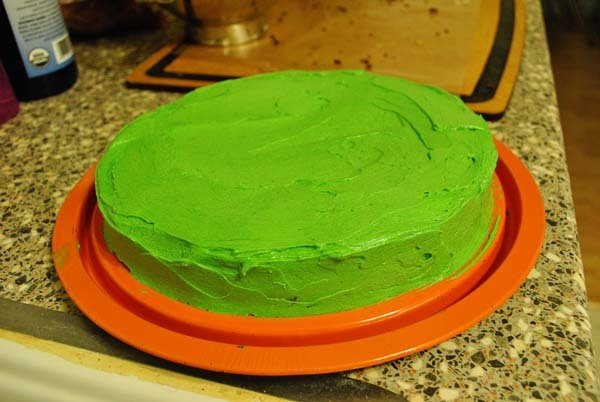 My sister and I had a little cross country bake-off for St. Patty's Day and this is what I came up with. 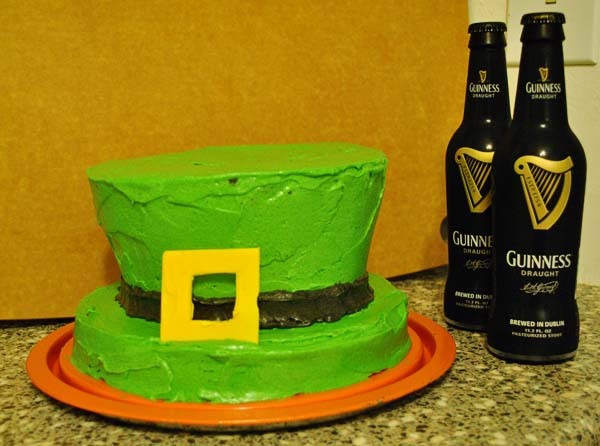 I used this recipe for a Guinness Chocolate Cake. 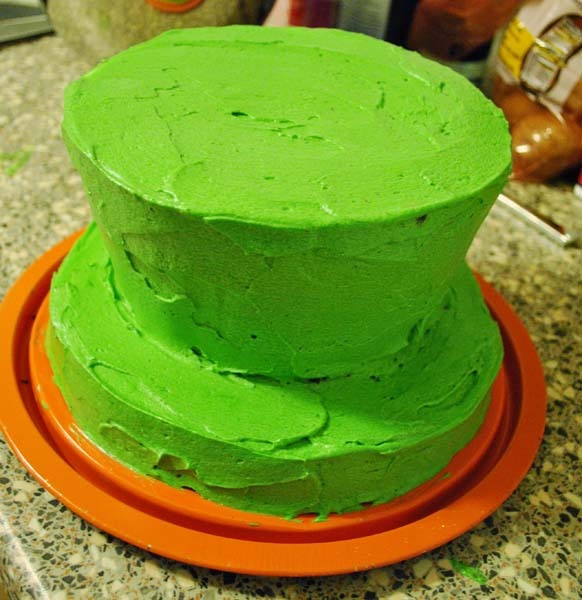 And the frosting is just a standard buttercream. I decided to make a hat fit for a leprechaun. 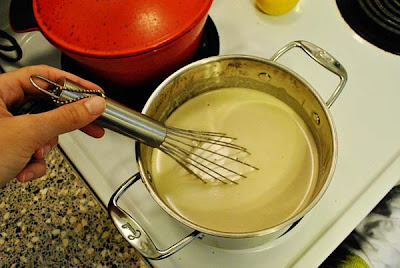 The only thing I'll say about the batter is 'don't worry about the weirdo foam'. 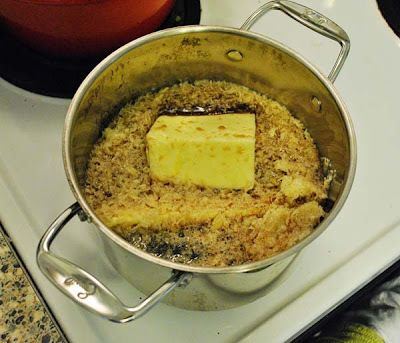 You have to melt the butter with the Guinness and it looks super weird during the process. 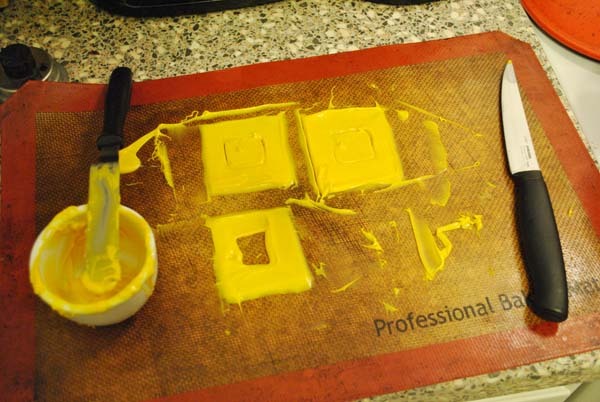 But it ends up lovely and smooth, like so. 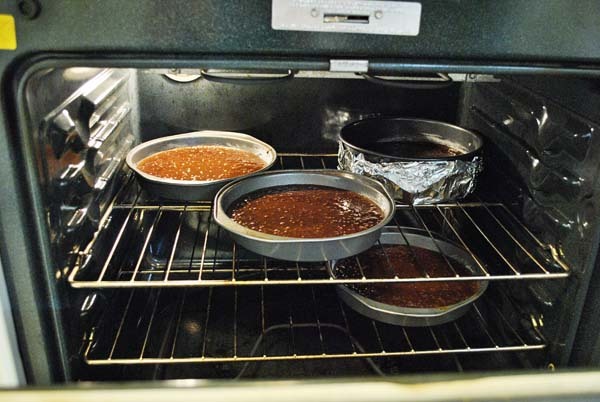 This cake is a pretty good size, I used 3 - 9" round pans and 1 - 10" springform pan, because it's what I had, and I wanted the bottom layer to be larger to act as a brim of the hat. 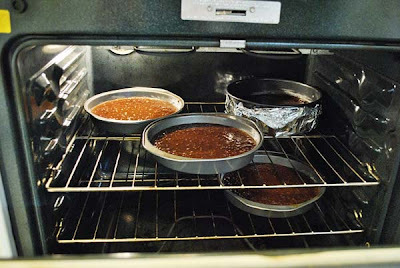 After the baking, I assembled the top 3 layers and popped them in the freezer for some later carving. 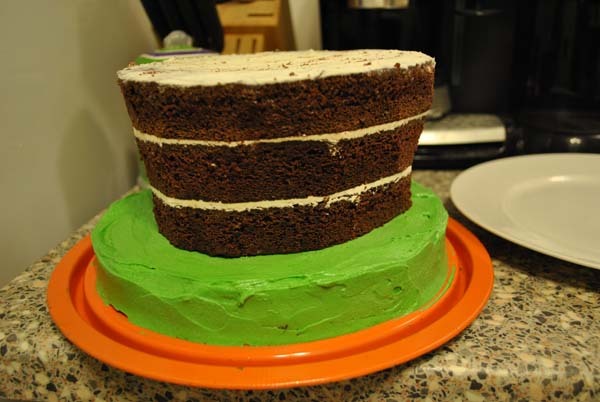 Then I iced the bottom layer. I set that aside and started carving the top of the hat. I wish I had a some 8" pans on hand, but I didn't, so I started out by making the whole thing a bit smaller, so that it would be noticeably different from the brim of the hat. Once that was done, I started taking wedges off of the outside, trying to angle the sides down to a smaller circle. 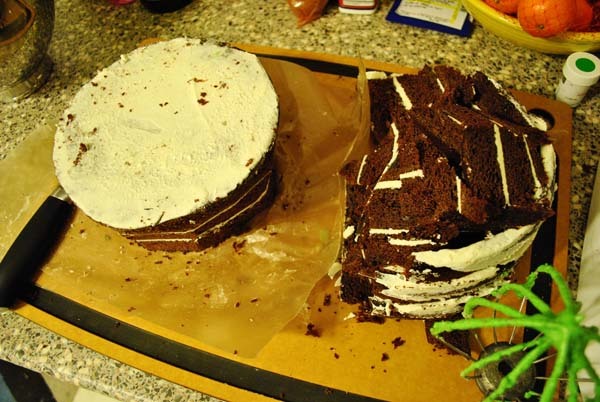 I ended up with a huge pile of leftover cake. 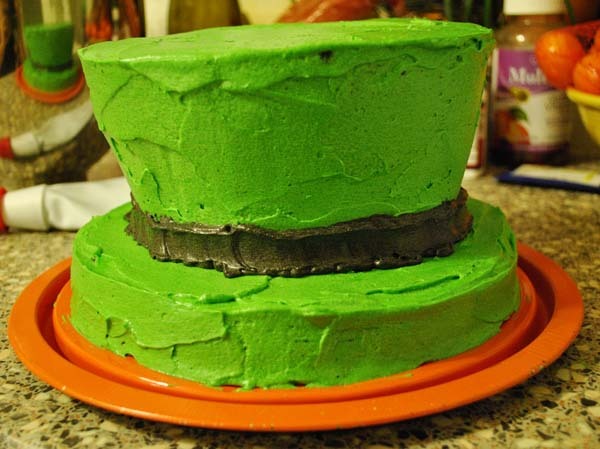 Then I set the carved part on top of the brim and iced the whole thing in green. 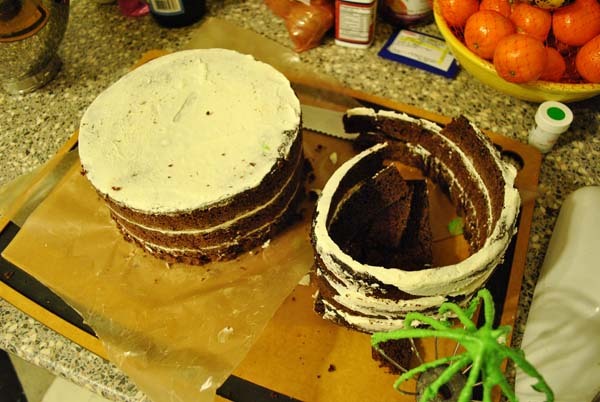 Afterwards I piped on some black icing for the band, and then I added a white chocolate buckle for the finishing touch. Don't forget about your freezer. 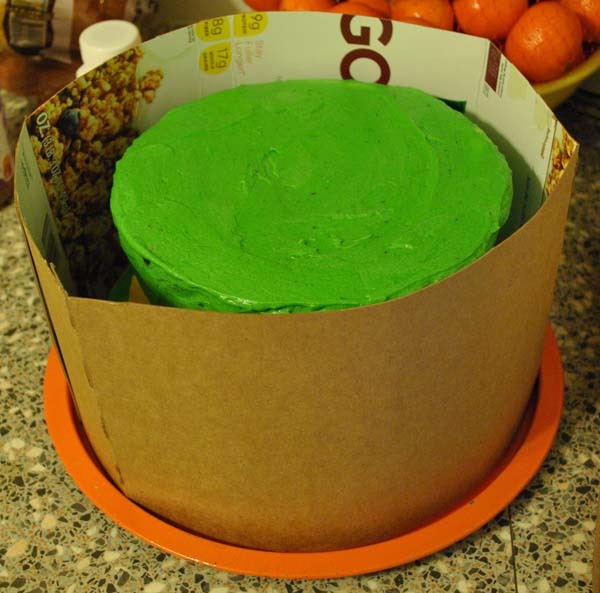 This sucker was tall and didn't fit in my cake tin, so I rigged a protector for it, but cutting up a cereal box and wrapping it around the sides. This looks amazing!! 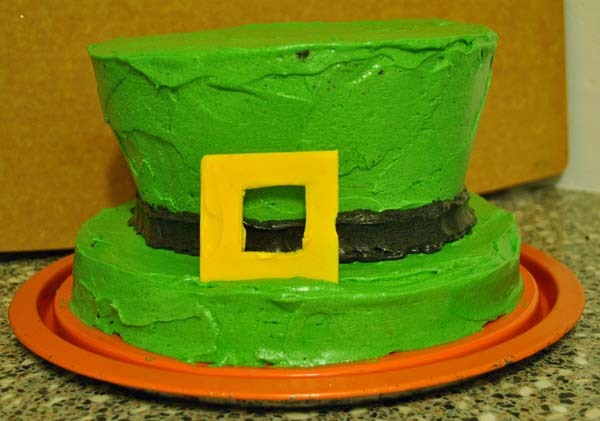 I love that you made a hat, I have been seeing a lot of clovers, very creative. It sounds and looks delicious.